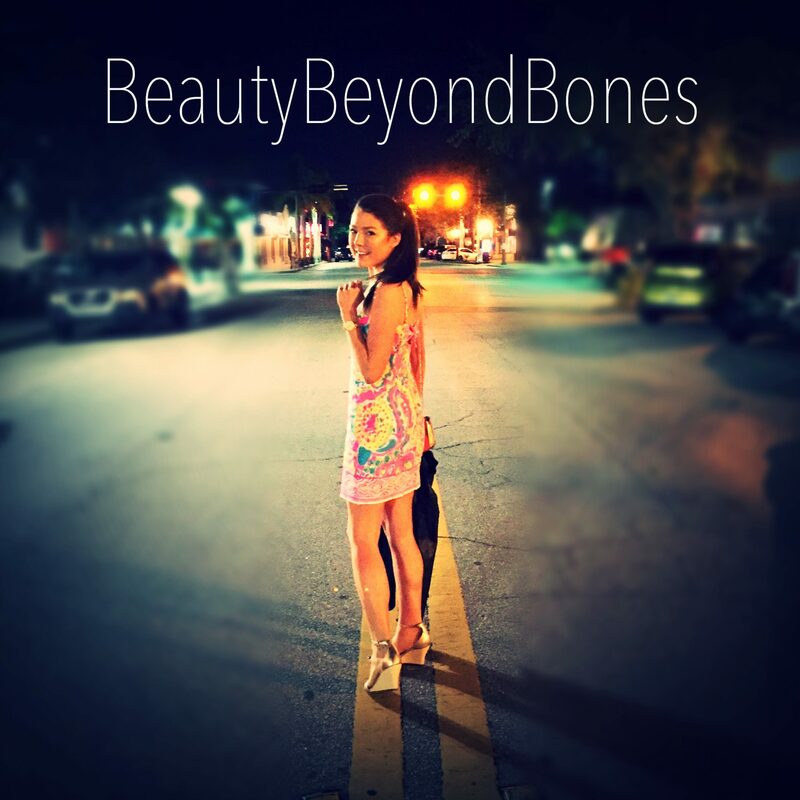 First off, real quick: thank you to everyone who has been stopping by my Amazon link (amazon.com/shop/beautybeyondbones) before doing their Christmas shopping! It’s a free and easy way to support my desktop ministry, and it truly makes a big difference! So THANK YOU! The masses were hunting for pie and eggnog. In hopes that their readers would enjoy them with flair! When what to their wondering eyes did they find? But a turkey-free main, of the Gluten Free kind! OK, ok, ok, I know…you’re sitting there thinking…just tell me what this deliciousness is that’s taunting my eyeballs right now!! Haha, I hear you, friend. I hear you. 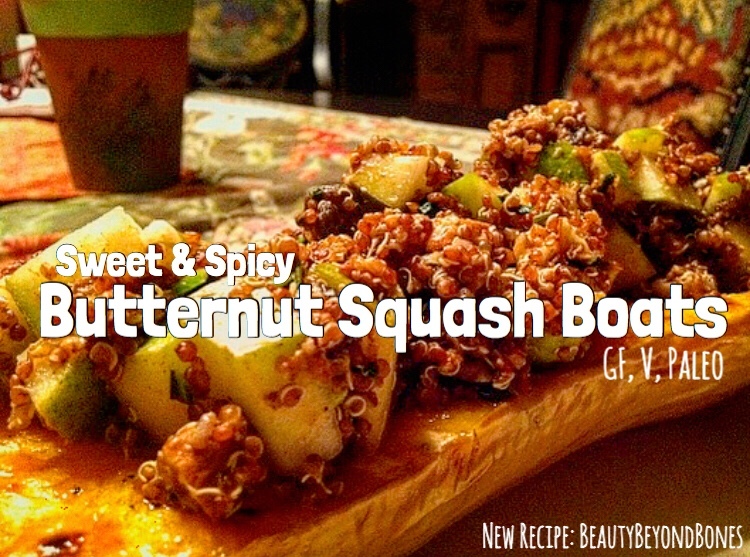 Allow me to introduce my beloved, and most requested recipe: Sweet and Spicy Butternut Squash Boats. A slow roasted butternut squash, stuffed with a pear, quinoa pilaf. Now, allow me to pause: If this photo looks dated, that’s because it is. Sadly, this recipe is not on the Specific Carb Diet (because it includes quinoa), so I can no longer enjoy it. BUT, back in 2010, during those 11 months on bed rest during my Ulcerative Colitis flare, I was experimenting with lots of different therapeutic diets, in order to find a solution that worked. So this recipe was born during that time before I adopted the SCD. And let me tell you, I still dream about this dish. It is Gluten Free, Vegan, and Paleo. And believe me when I say — OUT OF THIS WORLD. Not only is it visually stunning, but the taste is truly so unique and addicting, you’ll be pinning and bookmarking this post to return to again and again and again. I promise. After you cut it in half, rub the flesh with 1 tsp EVOO mixed with 2 drops of agave. Then, place it flesh side up on a baking sheet, and roast it in a 400 degree oven for about an hour – until fork tender. Nice and slow. While the quinoa is cooking, mix the dressing ingredients and set aside. After the quinoa is finished cooking, and has absorbed all the liquid, but before you fluff it with a fork, take it off the heat, and add your spinach, and immediately cover the pot for about 3 minutes, so that the spinach wilts. Then, add the dress and fluff/stir it in with a fork. Next, add the pears, almonds, and raisins and fluff/stir those in as well. Once the butternut squash is finished roasting, fill the cavity with the quinoa goodness. If you just can’t get enough of the quinoa, you can cover the entire squash with it, like I did! This meal was sensational! We already know that quinoa is a protein-packed superfood, but it is also SO versatile, and tasty! The flavor of this dish was wonderful – There was an inherent sweetness from the butternut squash, a bright sweetness from the pears, and an intense pop of sweetness from the raisins, with a spicy depth from the cinnamon and allspice. BUT! It was not at all overbearing because of the slight undertone of tang from the dijon mustard and lemon juice! The flavor was just so enjoyable. The other great thing was the mix of textures! The pears were crunchy, the raisins were chewy, the almonds had a nice bite to them, and the quinoa kind of *pops* in your mouth! It was like a party in your mouth! Complimented, of course, by the luxuriously creamy butternut squash. So ProTip: make some extra because everyone will be begging for a bite or two! Talk about pizzaz! This handsome fella is sure to bring smiles to even the staunchest of meat eaters! I thought it might be helpful to share some of my favorite Thanksgiving meals I’ve made throughout the years. So below, you’ll find links to all my Turkey Day staples! Your recipes, Caralyn, makes me drool because they look so delicious. The Sweet and Spicy Butternut Squash is definitely going to be made by me. I would like to make all the recipes. xoxo Love and hugs! Those dishes look incredible! I’m so sorry you can’t eat the squash dish. I take it there’s no SCD friendly substitute for the quinoa? Oh, and the turkey is great! Do you have a dip you recommend? I like Ranch with just about any vegetable, but I thought you might have a more eloquent idea. 🙂 Hope you’re having a great week! Thank you so much Kenneth! I make this dish with riced cauliflower nowadays, but eeh – not the same. I’m going to try it with almond flour! haha Ranch is always great! I like to stick to my trusty reliable: GUACAMOLE!!! haha thanks, friend. you too! Hey. Sorry, didn’t know how else to ask. If I go to your Amazon page first, then search for what I want, you’ll still get credit, even if I don’t see your name anywhere in the address or the product page I’m after? I didn’t see a special link or anything, just the regular search bar at the top. Thanks! Want to be sure you get credit for it. I sure hope that YOU have a great Thanksgiving. You are very graciously welcome. Hugs and love back. Hopefully, you can run barefoot through the leaves. Love your recipes! Thank you, from a gluten sensitive reader! I declare you poet of the year. LOL. That was a fun read. Loved your little poem, Caralyn. So cute! Wow that looks amazing. Perfect for your Thanksgiving table. Are you still selling a cook book? My co-worker just told me that she has ulcerative colitis and is taking a medication. I’m no doctor, but certainly if your SCD could help her, I’d love to share the information. Thank you so much. Thank you. You are amazing!!! Caralyn, you are back in my life. I am home recovering from the Surgery. Mending is on schedule and I am trying to adhere to a Diet that will be a challenged. I love your posts and support you to an unexpected level. Keep up your good works. Love you. So I stopped by your storefront on Amazon… And wanted to make sure I understand the process because ‘we’ (your followers, fans, admirers, stalkers, possible future bf/husband/ colleagues/ and readers) want to help. So can we purchase any item through Amazon after going to your store front link, or is it only when we select an item contained/shown on your storefront? Hi! Oh my gosh you are so wonder for asking! YES! So, ANYTHING you search for, will be credited. It doesn’t have to be a highlighted item in my store front. The way it works is that, when you stop by my storefront first, Amazon “flags” your IP address , and then whatever purchases you make on Amazon after visiting my site, will be credited. (And don’t worry, the “flag” thing may seem scary, but it’s just a way for them to attribute my store front as the “catalyst” that got you onto the Amazon site, if that makes sense. It doesn’t affect the prices you pay, or the ads you see, or sales or coupons or anything like that. It is just strictly for the influencer storefront attribution). Again, THANK YOU – you are incredible, and I appreciate you!!! 🙂 have an awesome day. It’s snowing here in NYC, I hope it’s nicer where you are! I am happy to help. And that is awesome news, that we can purchase anything! You know what feels amazing BBB? When we have the opportunity to help others live their dreams, to see and witness miracles, and it doesnt take much on our part at all… all we need is a willing heart and spirit. Amen! May you continue living out the plans and dreams God has laid out for your life and continually be blessed and surprised by the things God has already prepared up ahead for you. Really quick, sometimes we get scared early on, on our journey because we begin to understand that we will have to sacrifice/let go of many things in order to do his will and not ours- including things we want, material possessions, habits, and even some of our personal aspirstions/dreams. And to give up someones personal dream is no easy matter, its asking too much too soon. Ahhh, but hold steady and continue forward ahead. Trust in God, and you will discover things YOU never dreamed of, but God did. We now see that by giving up our dreams, we can now live Gods dreams and plans for our life. And let ask would you like to live your dreams? Or how about living out the dreams of God who created everything in existence, the stars, the sun, the moon? Need I say more. So, what I am going to do is simply bookmark your link, and anytime I want something from Amazon, go to my bookmark to help. I ll send others you way as well. I read this over the weekend and shared with my sister-in-law. We are looking forward to trying these for Thanksgiving!